An arctic blast gripped the tri-state Thursday, sending wind chills plummeting well below zero, closing dozens of schools, fouling the commute and leaving winter-weary locals dreaming of the massive warmup to come next week. 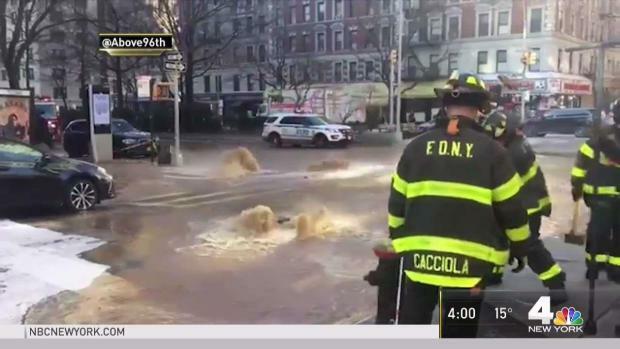 The city is fighting to stay warm amid blistering cold. Adam Kuperstein reports. The air was so cold that the National Weather Service warned of frostbite with as little as 30 minutes of exposure. Wind chill warnings and advisories cover virtually the entire region through mid-morning, and even by afternoon single-digit feels-like temperatures will be the norm. Click here for all severe weather alerts. 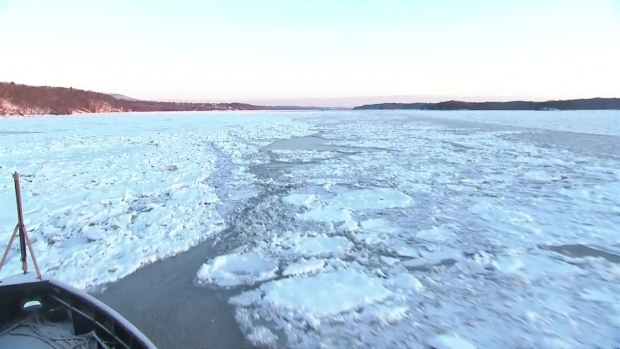 Raw video shows a Coast Guard cutter breaking up the ice in the Hudson River to keep the shipping channel to Albany open. Get full forecast details here. JFK Airport's low temperature of 3 degrees shattered a record that had stood for 42 years. In Manhattan, a frozen Bryant Park fountain, one of the most iconic New York City cold weather visuals, appeared in epic purplish form, while the Hudson appeared more ice rink than river, with Coast Guard crews cutting through the ice to keep the channel to Albany open for shipping. 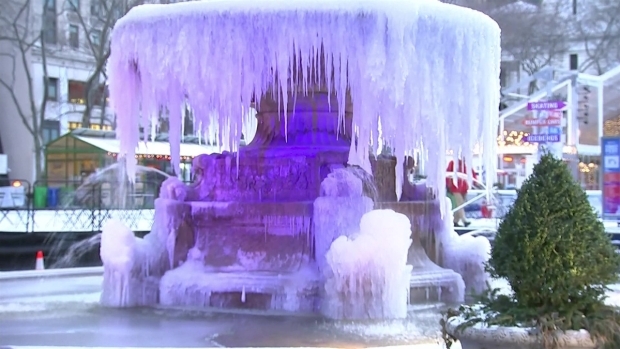 A frozen Bryant Park fountain is one of everyone's favorite "cold city" visuals. And it looked pretty epic on Thursday. Get full forecast details here. As of 7:45 a.m., wind chills were down to -17 degrees at JFK, and -15 degrees at Newark Airport, where firefighters were battling a massive blaze that incinerated at least a dozen cars. Every single one of the nearly 20 reporting locations listed by the National Weather Service had a wind chill that was in the double digits below zero. The weather improves slightly on Friday, bouncing back up to a comparatively balmy 24 degrees, then should rise above freezing Saturday. By Tuesday, highs will be near 60 degrees.